Isabella Hutchison could easily be called the founder of the University of Miami women's athletics program. Hutchinson is simply a pioneer in the area of collegiate women's athletics. She came to the University of Miami in 1965 with the mandate of beginning a women's intramural sports program. From that beginning, Hutchison went on to coach numerous sports, including tennis, golf, basketball and volleyball. 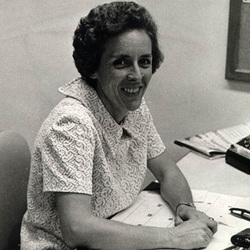 She served as the Hurricanes' women's tennis coach from the early 1960's until her appointment as Director of Women's Athletics in 1977. From 1973 to 1977, her tennis teams complied an impressive 75-3 match record. During this era of dominance on the women's tennis scene, Hutchison's teams finished among the USTA National Tournament's top five four of five seasons. In 1972, Hutchison was responsible for making sure that Miami would be at the forefront of the women's athletic program with Title 9 becoming a reality at all Universities during the following years. With her involved at the time Title 9 passed, UM was able to begin a full recruiting program for women which made the University of Miami the first of all major universities to do so at the time. A total of 15 scholarships were offered that first year. Outside of Miami, Hutchison is well known in the cause of furthering women's athletics. She was President of the Florida Association of Women's Intercollegiate Athletics from 1977-79, Chairperson of many AIAW and NCAA committees from Swimming and Diving, tennis to awards and officiating. Following her time at Miami, Hutchison went on to serve as Associate Athletic Director for Women's Sports at Indiana University until her retirement from collegiate athletics in 2000.